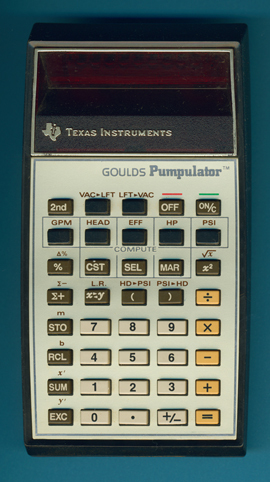 The Goulds Pumpulator was one of the early customized calculators produced by Texas Instruments. Basically this calculator represents a Business Analyst-I but was changed with a custom designed program memory to do be used as a pump calculator for use with the English system of measurement. A similar approach was later realized by Jeppesen Sanderson with their Flight Computers, e.g. the Avstar. Dennis Belillo gave us some hints about the functions and keys of this mystery calculator. With the introduction of the TI-58 Texas Instruments created the Solid State Software Modules™ to customize calculators. Have a look onto the insurance fee calculators from Agrippina, Allianz, Lloyd, LVM, Nordstern or Victoria.